The Board of Trustees, Alumni, Residents and staff of International House note with great sorrow the passing of our Honorary Trustee Abby M. O’Neill. Though her first contact with International House began at the knee of her grandfather and International House co-founder John D. Rockefeller, Jr., her role became official when she was elected to the Board of Trustees in 1958. For more than four decades, she faithfully served the International House mission of global understanding through her extraordinary leadership, financial generosity, and personal commitment, serving on numerous committees as I-House’s tireless champion. 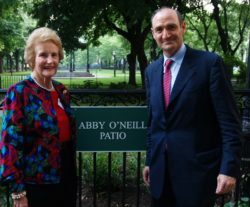 In June 2008, members of the International House community paid tribute to Mrs. O’Neill on the occasion of the 50th anniversary of joining the I-House Board, naming the patio outside Sakura Park in front of the original 1924 entrance to the House in her honor. Mrs. O’Neill’s uncle David Rockefeller, was elected to the Board in 1940 later named an Honorary Trustee. Sadly, he too recently passed away. Other family members who have served on the I-House Board include Abby Aldrich Rockefeller, John D. Rockefeller III, Peggy Rockefeller and, since 1997, Peter O’Neill, ’92, Mrs. O’Neill’s son, who currently serves as Chair of the Executive Committee. Mrs. O’Neill was known for her concern for the educational and cultural opportunities of young people from around the world, and a peerless dedication to developing people-to-people understanding. She will be greatly missed by the International House community and beyond and our sympathy is extended to her entire family.